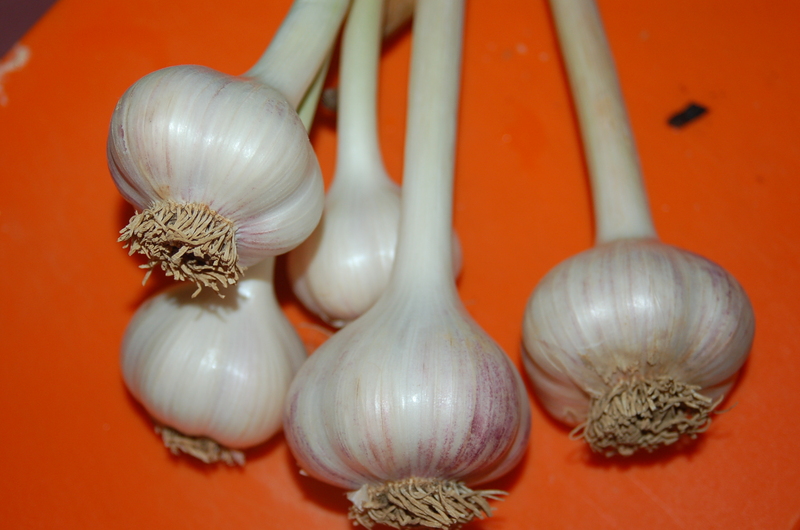 garlic | Crappy Kitchen - Good Dinners! Yes, yes, I’ve been a slacker, but I have undertaken a few more ventures in my already too-packed life and so my poor blog has had to suffer until I got everything up and running – so, here we go! Really yummy beef sir-fry for dinner! 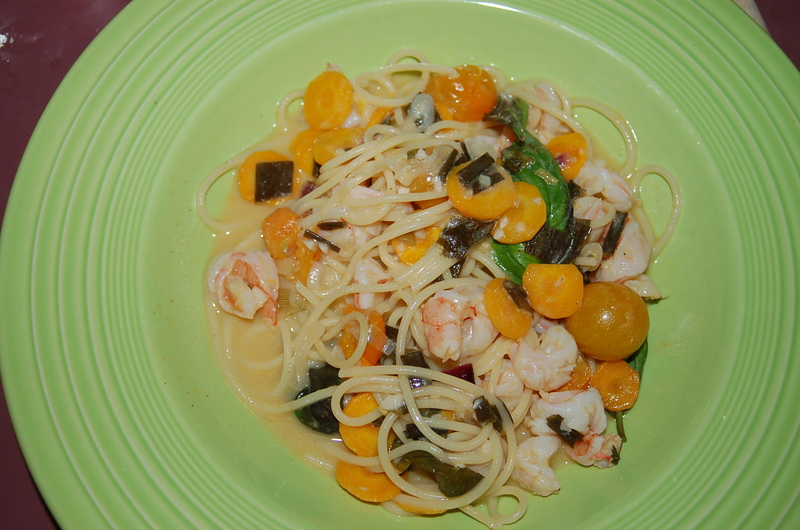 The blog may have been MIA but that certainly does not mean that the Crappy Kitchen was collecting dust: I have been cooking up a storm most nights and here is something that I was begged to cook by my son. He had a longing for something I rarely cook, beef, so I succumbed and made something that would please everyone: a whole wok-full of thinly sliced stir-fry beef with rice. It was delicious beyond belief and even thought it is a tabu food on my particular diet (Blood Type A) I couldn’t help “test tasting” a little more than was good for me! 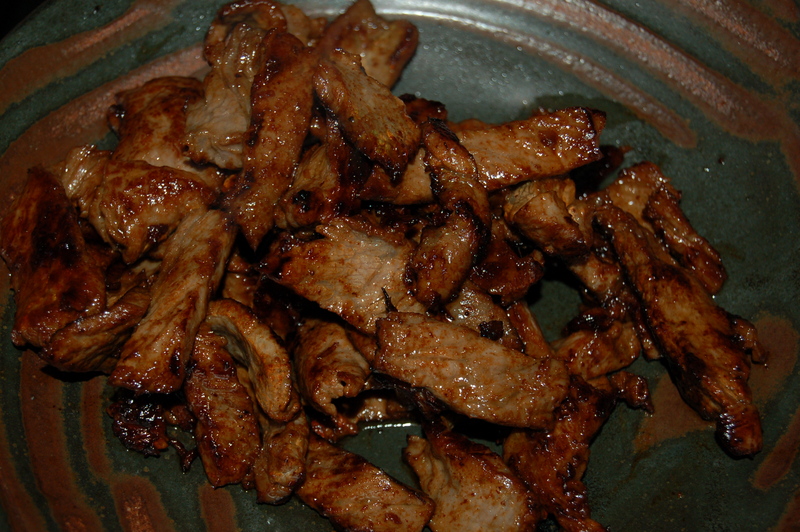 Fry beef – Hot and Fast! 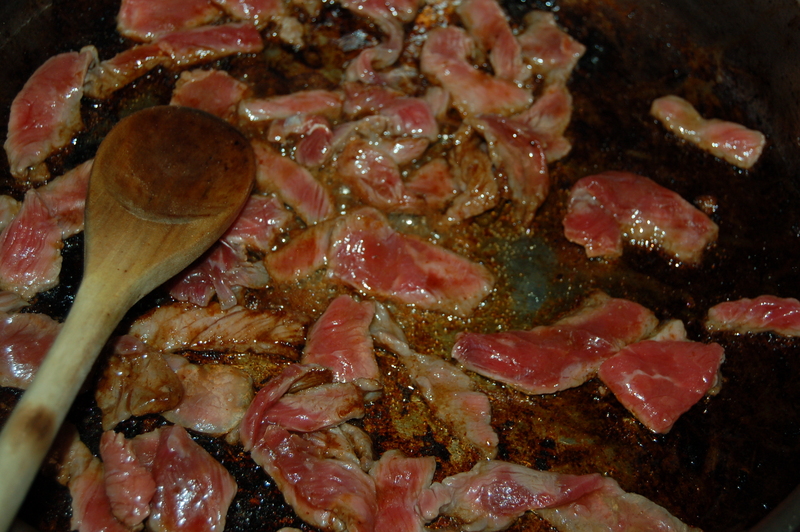 1 – Mix the soy, mirin, sesame oil, pepper flakes and sugar in a large bowl and add the beef slices. Cover and set aside in the fridge while you prep the rest of the ingredients. Put large saute pan or wok on high heat. When it is very hot, add 2 tbs of oil and add 1/3 of the beef, shaking off the excess marinade and distributing it over the entire surface of the pan. Let it cook for a minute (do not touch it as it sizzles!). Turn and shake the meat about and cook for another minute or two until cooked. 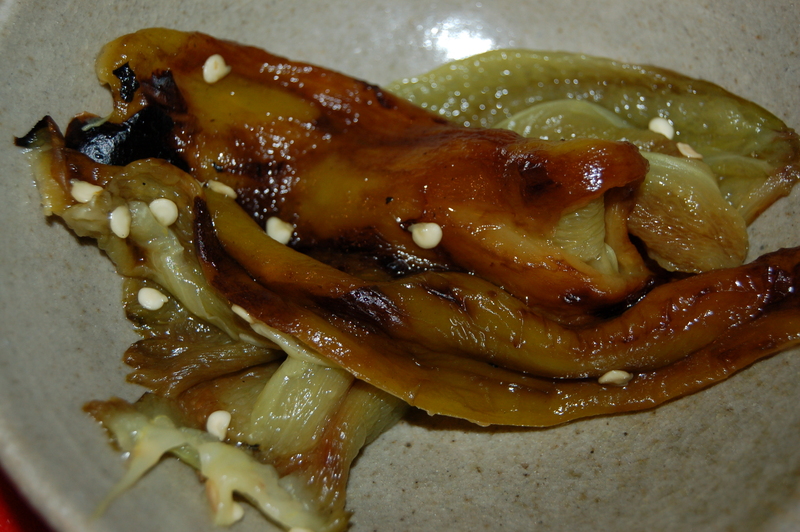 Test a piece by eating – it should be tender and soft. Transfer to a bowl. 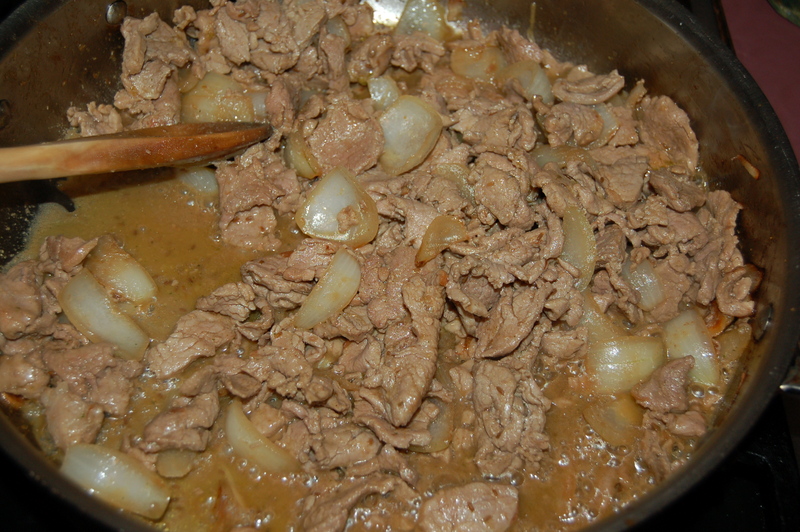 Add more oil and continue to cook the beef in batches until it is all done. 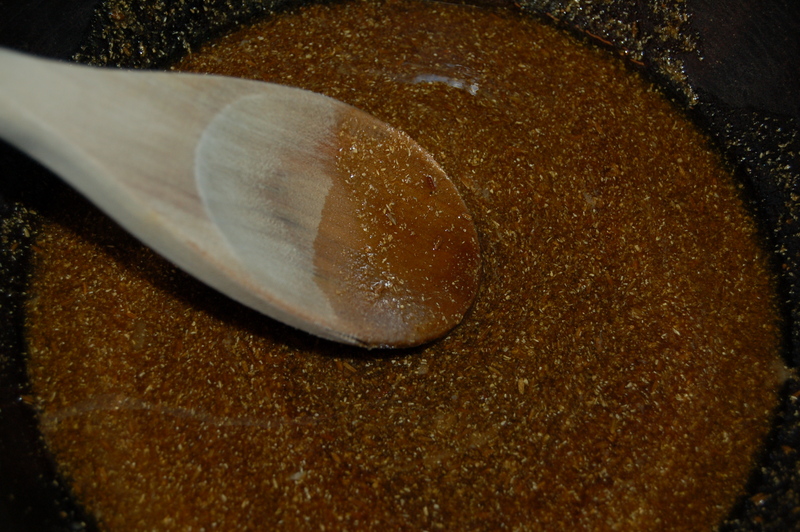 Reserve the marinade that is left in the bowl to be used later. 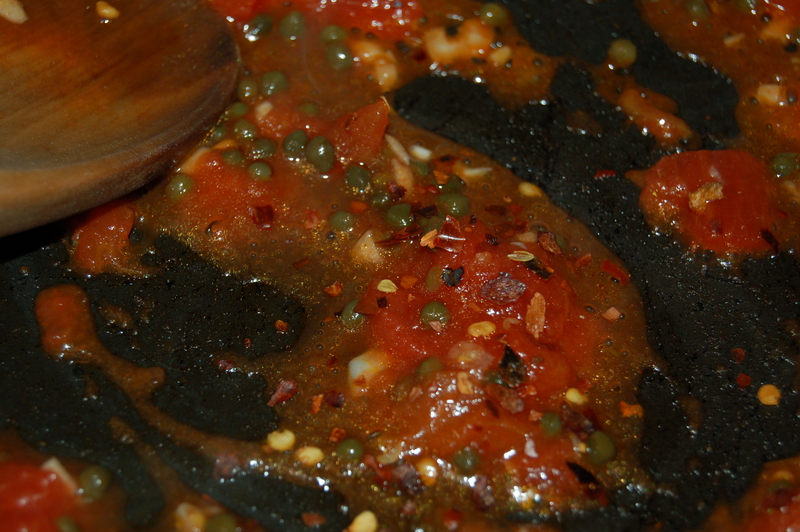 2 – If the pan is very dark and blackened on the bottom, you may want to give it a quick cleaning before you continue. 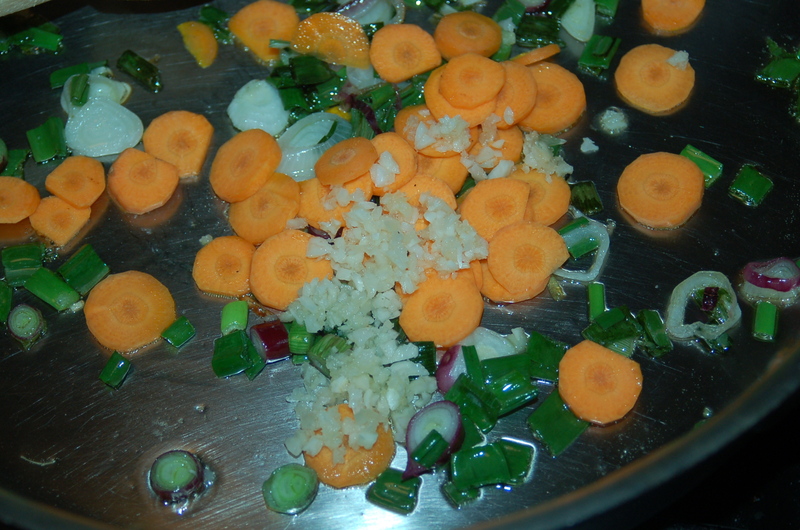 Add a little more oil and with the pan on high heat, add the scallions, garlic and carrots. cook for two minutes, stirring often. 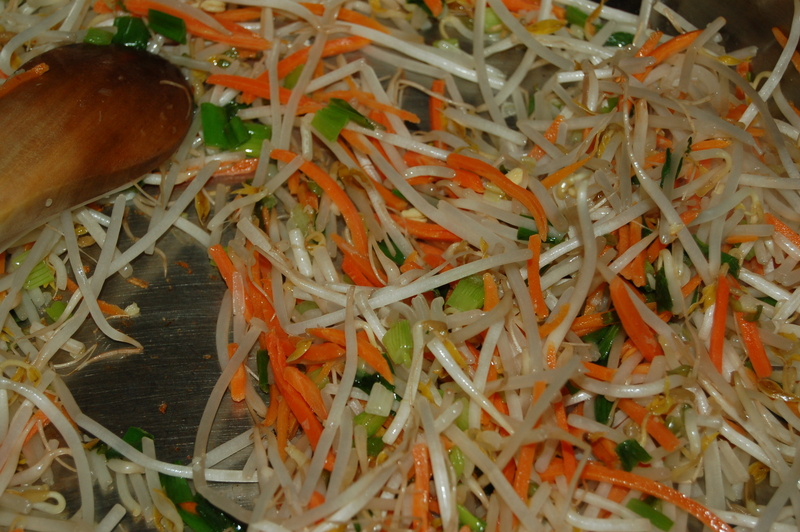 3 – Add the bean sprouts and continue to cook for 1 more minute. 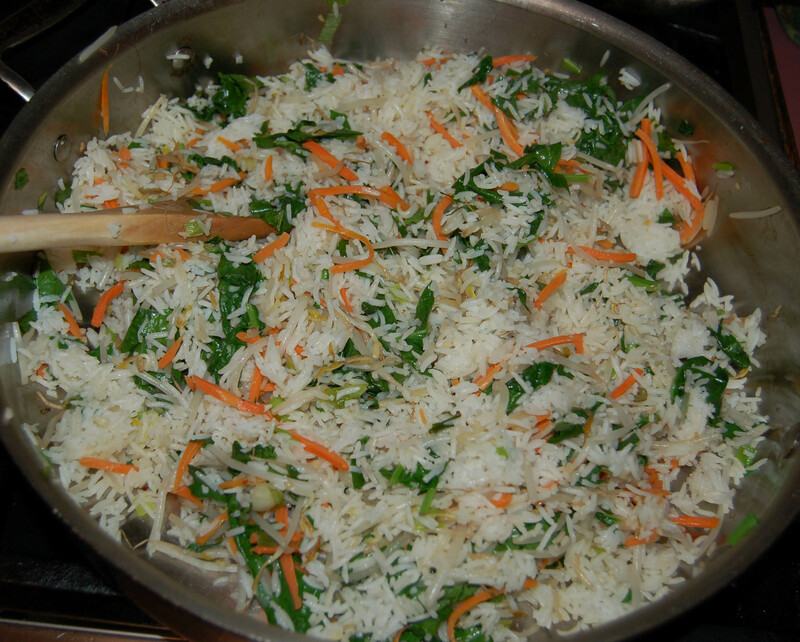 4 – Add the chopped spinach and cook for about 30 seconds before adding the rice. 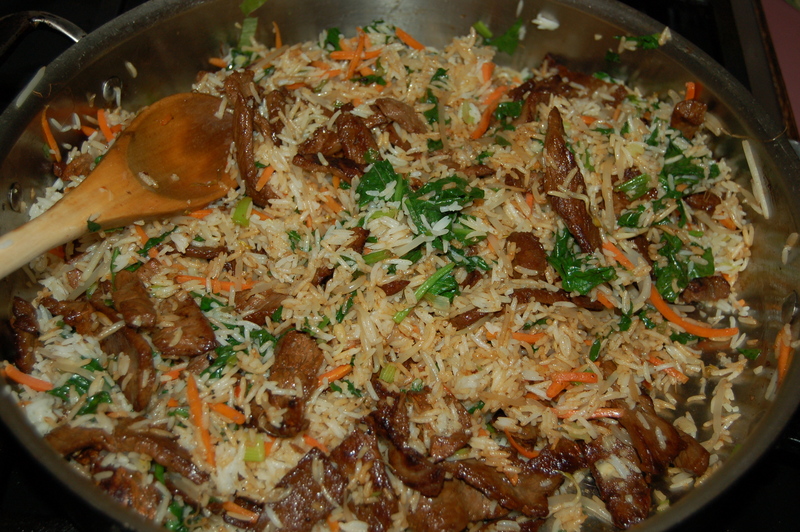 Stir everything together and cook until rice is hot. 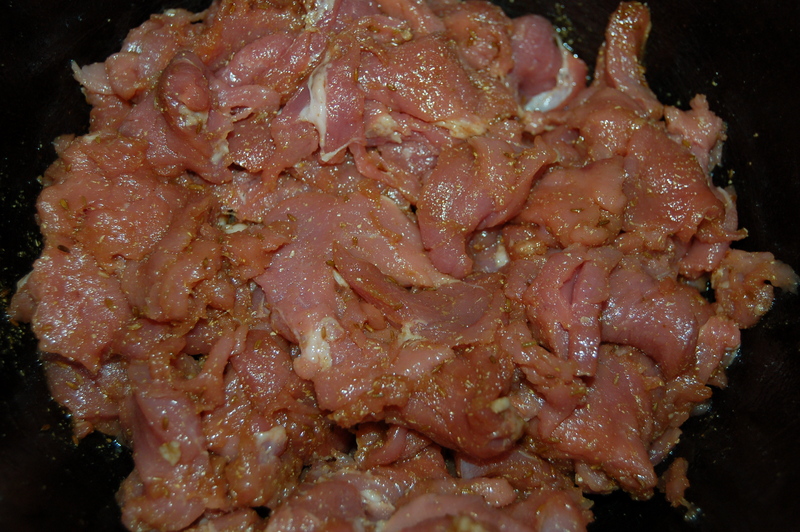 5 – Add the beef and its accumulated juices, as well as the rest of the marinade. Mix well and turn off heat. 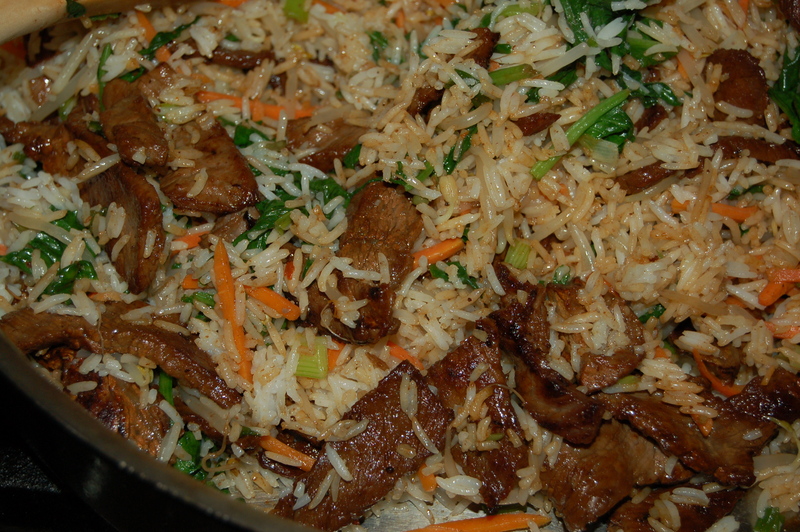 Taste for addition of more soy sauce or a soy sauce and mirin mixture. Serve immediately in warmed bowls with more soy sauce and a dose of sriracha sauce if that is your thing! This is the kind of dinner that requires little work but has great results. When I am at a loss as to what sorts of flavors I want to come up with for dinner, and I am low on things like fresh herbs, I turn to the foods that I buy specifically to get around these problems; these apple & onion sausages did all the work for this dinner in the flavor department. I can’t say that I ever buy instant food to get me out of those nights when time is precious and hungry offspring are gnawing at my heels in search of dinner. I know that there are some frozen and packet meals that are good enough, but honestly, what is out there is mostly not that great (and I’m being nice). My idea of instant food is buying say a piece of meat or fish that has been marinated in a mixture of herbs and spices for quick and convenient cooking, or the likes of the sausages that I used to whip up this great curry. And yes, curry powder is my other instant go-to food. Nowadays you can find some fabulous mixes and they last forever. The other trick is to buying a cut of meat that has no bones or skin to contend with (the chicken thighs for this dinner to be precise). I’m all for bouillon cubes and fresh frozen peas if it will keep you cooking healthy meals most evenings. This dinner is a demonstration in how to make something that takes just a little longer to cook than a large frozen pizza or pasta dinner. Don’t you think that you and your family are worth it! 1 – Season chicken things with a little sea-salt and freshly ground black pepper. Put pan or heavy casserole on high heat and add a couple of tbs of olive oil. When oil is hot sear chicken things until browned. Transfer to a plate as you go. 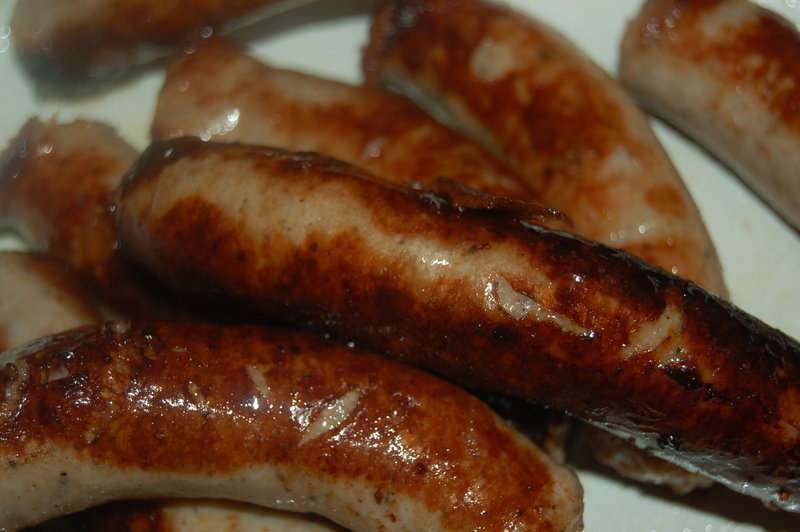 2 – Brown the sausages in the same way and set aside. 3 – Turn the heat down to medium and add the butter. When it melts add the onions and garlic. cook for about 8 to 10 minutes. Next add the spices and flour and mix together. 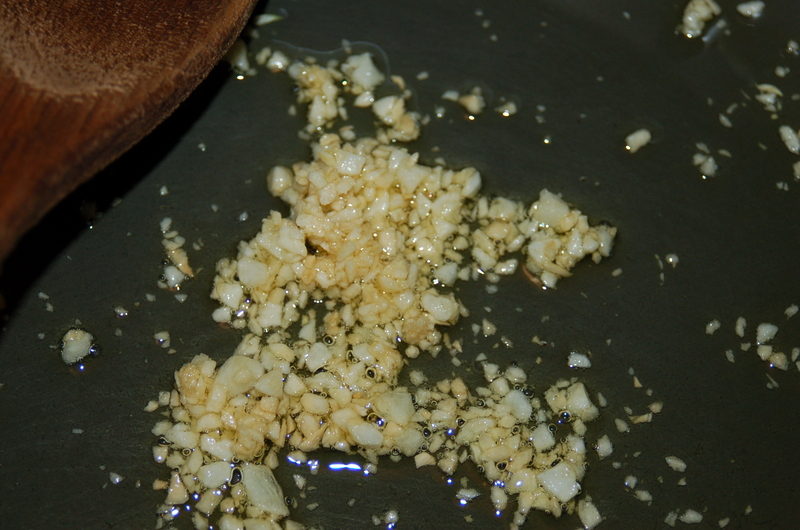 4 – Add the bouillon cube and water (or chicken broth) and bring to a simmer. Add the cream and stir. 5 – Place the chicken and sausage back into the pan in an even layer and bring to a simmer. Turn off heat and cover with lid. Place in preheated oven for 40 minutes. Remove from oven and check to season more and if the sauce is the right consistency for you. If it is too thick add a little more cream or hot water and mix gently. 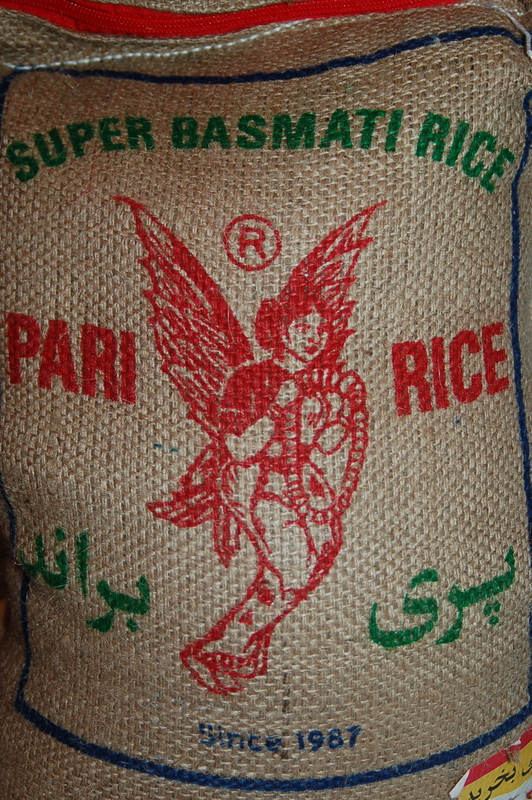 serve with rice, pasta or bread. Of course a salad would be welcome too. I walked into my house last night at 8.05pm and was sitting eating this lovely dinner with a glass of wine by 8.20pm – talk about Fast Food! You know those nights when you arrive home late and all you can think about is food? This can go a few ways: you can grab a microwave-able dinner, eat something like a hunk of bread with cheese, or take one moment longer to think about what you could cook and go for that. Last night I choose the latter. I felt really hungry yes, but I also knew that I deserved something good and something that I would actually enjoy once I had taken my coat off and sat down. We go that extra mile for so many things that are less important than moments like this and I have learned to recognize those moments. Within 5 seconds I had scanned the fridge and saw a jar of capers and the lovely parm cheese. The next thing I did was put a pot of water on for pasta and made a vow to have the whole thing ready by the time I was draining the spaghetti. There was even time to pour a glass of wine while I waited for the pasta water to boil! My dinner was more lovely than you can imagine and I slurped up every last bite like it was my last supper. 1 – Immediately put pasta water on to boil: Add a tsp of salt and a drop of olive oil to the water and cover with lid so the water comes to a boil faster. Add the spaghetti when water boils and cook according to instructions. 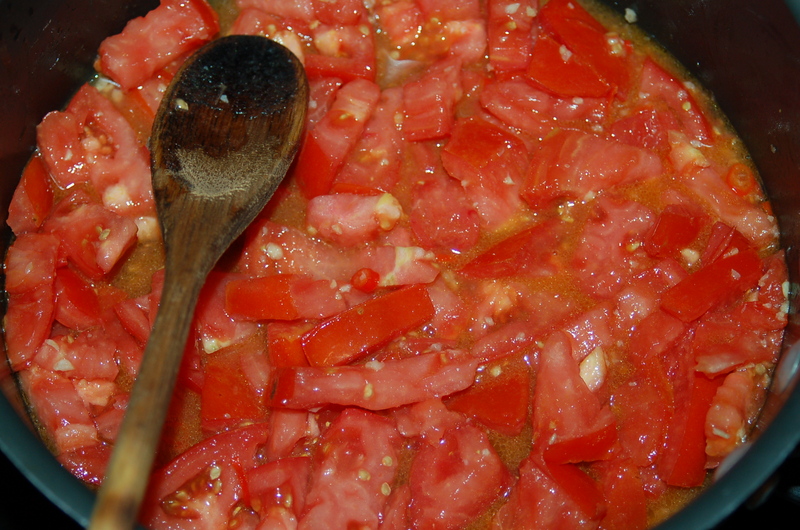 When ready to drain, scoop out about a 1/4 cup of pasta water and reserve for your sauce. Do not rinse pasta. You will be transferring hot pasta directly to your cooked pan sauce. 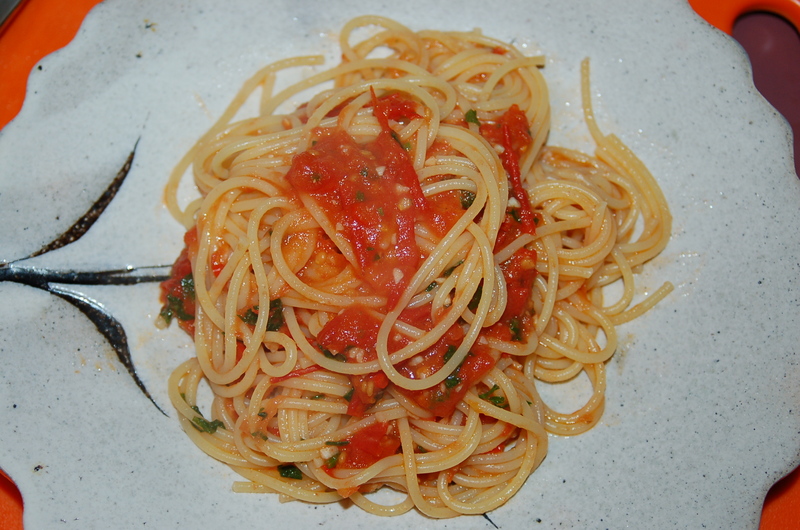 Cook spaghetti…reserve some cooked pasta water and do not rinse noodles when cooked! 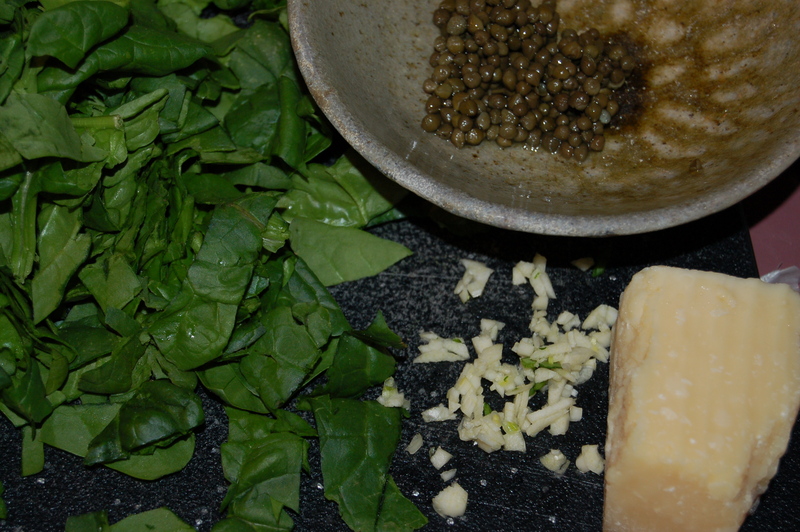 2 – Prep ingredients as instructed above. When you add the pasta to the boiling water start to make your pan sauce. Put saute pan (big enough to hold the completed dish) on medium/low heat and add the oil. 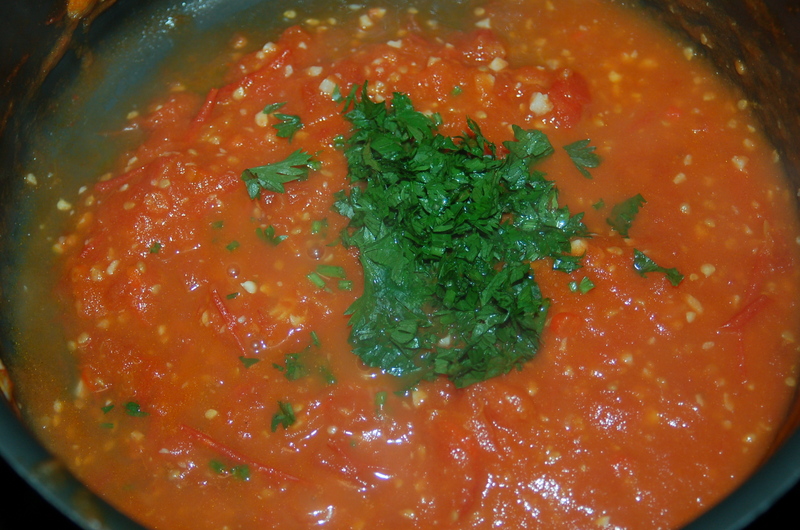 When it warms, add the tomatoes and juices and let it cook for 1 minutes. 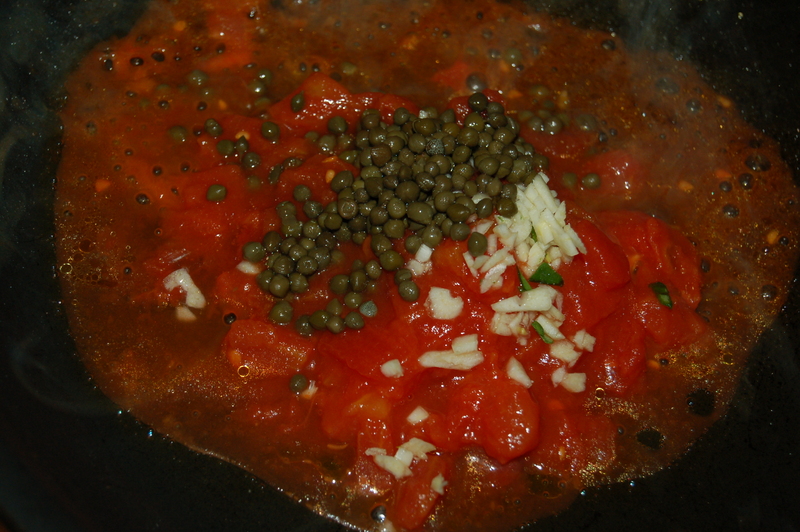 Add the garlic and capers and stir. 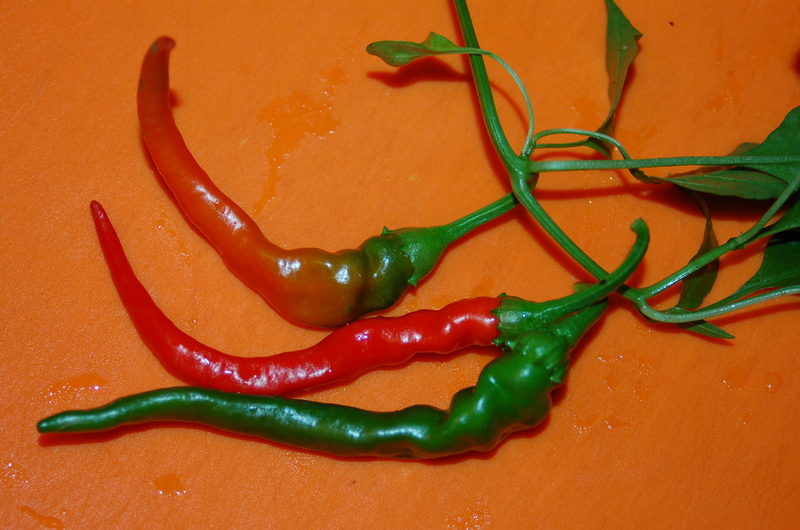 3 – Add the chili flakes and cook everything for a minute or two. 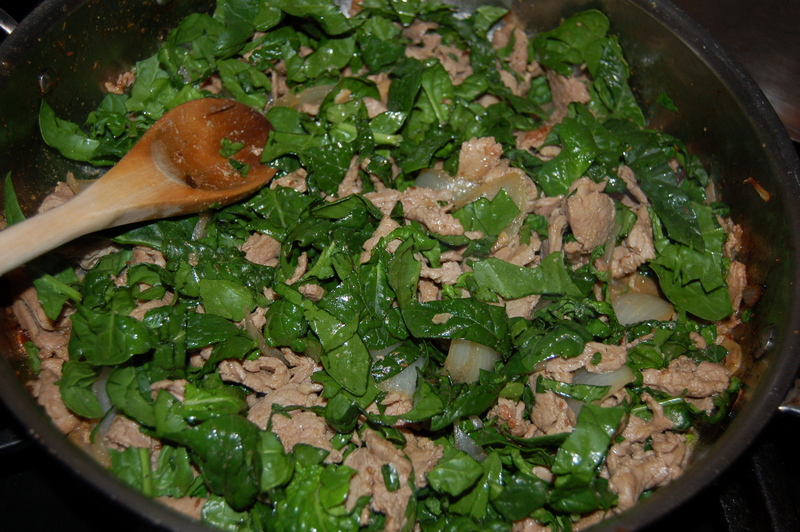 4 – Next toss in the spinach and stir everything together. 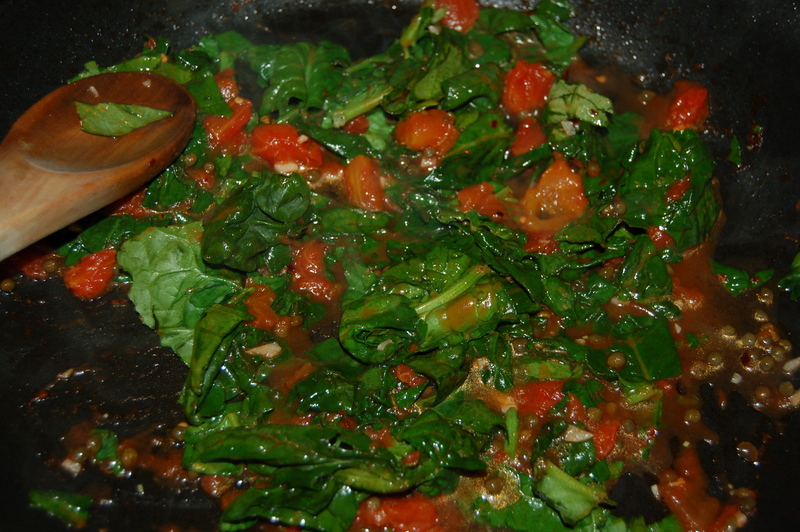 Spinach will wilt and begin to cook into the sauce after a minute or so. 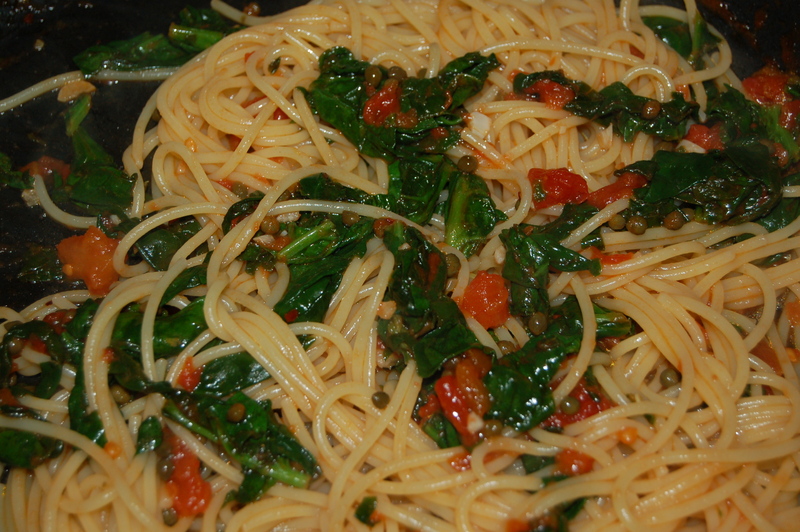 5 – The moment the timer goes off on your pasta, scoop out a 1/4 cup of water and add to your pan sauce. Drain the pasta and immediately add to the pan. Turn off heat and mix everything with the help of two wooden spoons. Tip the entire dish into a waiting warmed bowl or plate and garnish with the grated cheese. Drizzle with a good quality olive oil if you have it. I had decided to do my grocery shopping in the early evening and knew by the time I got home, and completed the dreaded job of putting everything away, it would be a late start with dinner. 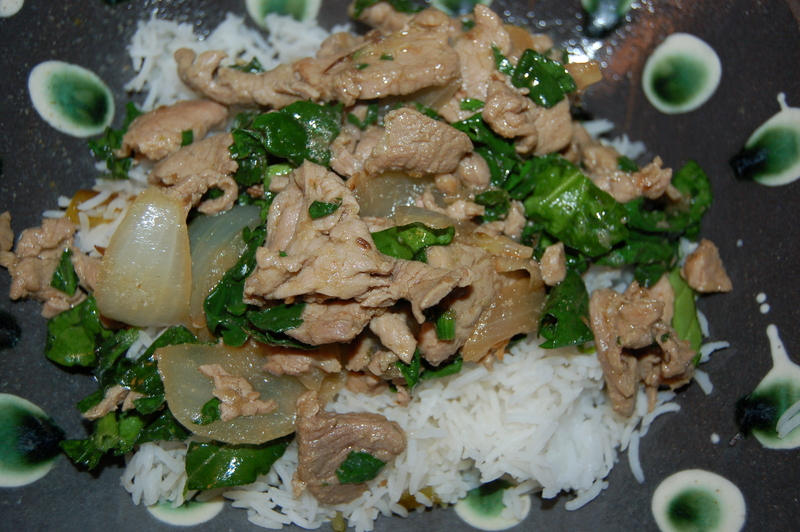 Never fear; this dish was the answer to the pangs of hunger growling in my house! This comes together in about 30 minutes, and it is well worth the effort. 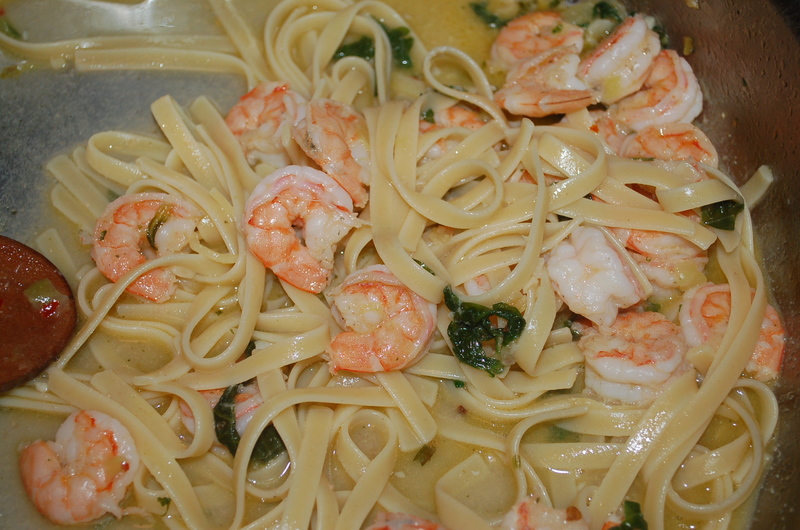 It smells heavenly as the garlic cooks in the oil, and the tender shrimp clinging to the lemony noodles lend a note of sweetness to the air. That, along with a lovely perfume-y Riesling I had treated myself to while out shopping (my reward for tramping through aisles of groceries with my big-wheeled metal basket! ), was the perfect end to a hectic day. 1 – Prep all ingredients before you begin cooking, as this all happens pretty fast. 3 – Put a big saute pan on medium heat and add oil. 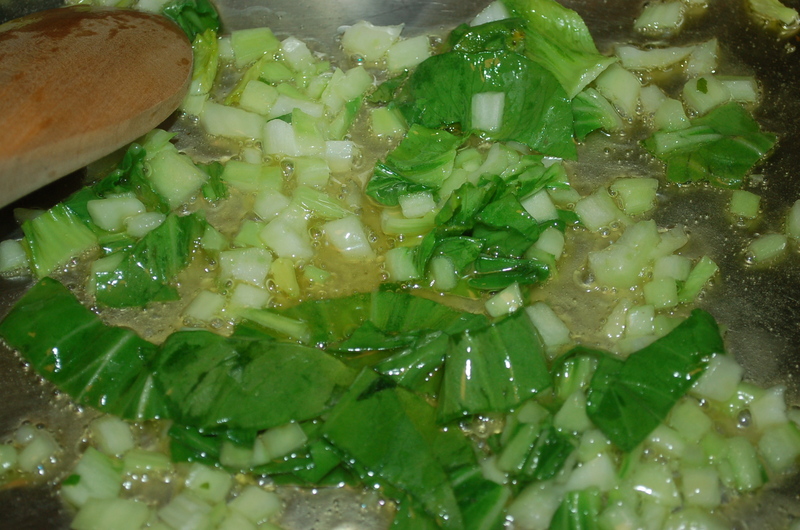 Add the diced white parts of bok choy and garlic. Cook for about 5 minutes before adding the chopped greens. Continue to cook for another 3 minutes or so. 4 – Add the broth (or bouillon & water), and bring to a boil. Add the shrimp and pepper flakes and bring to a simmer. Cover and cook at a gently simmer for about 3 or 4 minutes. 5 – Turn heat off and add the butter and lemon juice. Taste for addition of salt and pepper. Toss the cooked, hot pasta into the broth. Add some pasta water if you like a looser sauce. 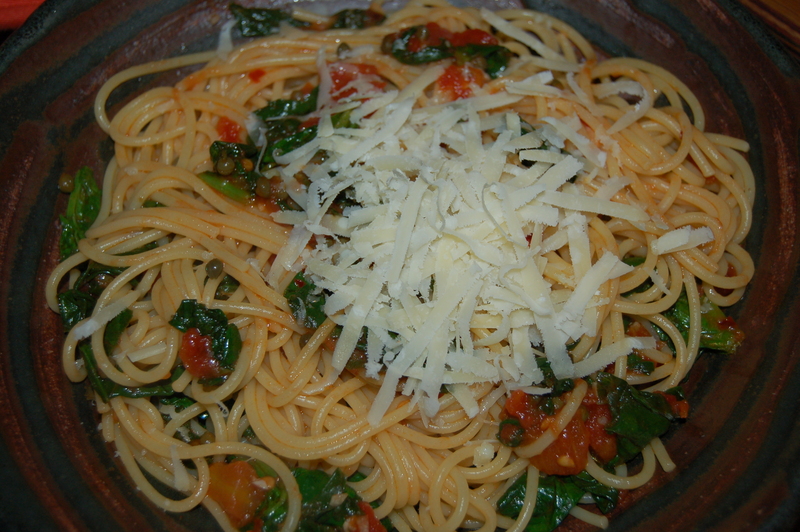 Serve with a nice grating of cheese (if you like). This dinner was completely driven by my CSA box of veggies which I receive from Good Work Farm each Wednesday (see top right of this blog for what a CSA means etc). It is getting to the point in the growing season where more and more vegetables are maturing, and so yesterday, I was greeted by wonderful purple, red and yellow potatoes, dill, yellow cherry tomatoes, purple bunching onions, cucumbers, carrots, beets, tons of basil, and 5 fabulous heads of garlic from Rambler Farm (Good Work have co-oped with them to give their CSA members lots of variety). Wow – what a harvest! I wanted to cook it all, just to taste it. This is why I get excited about the Summer! When I put all the vegetables on my counter top, I decided that everything besides the protein (I was defrosting some shrimp) would come from my CSA box. I went with something that would highlight the vegetables, and so made a light tangy broth with wine, butter and lemon juice (oops, where did that lemon come from?). I cannot tell you the difference it made to the dish to use produce that was barely out of the ground from a few short miles away. 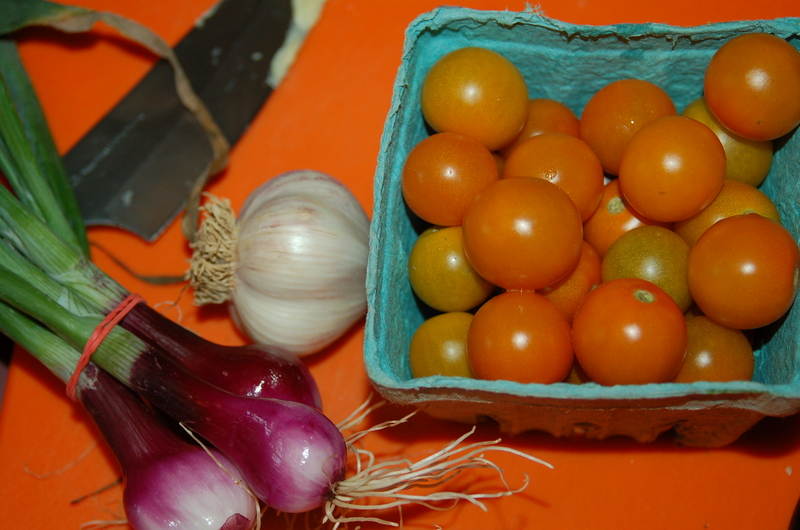 I could taste every nuance each vegetable had to offer, from the sweetness of the tomatoes to the sting of the garlic. The result of using fresh local produce - Yum! When I presented this bowl of goodness to my children I felt as if I were giving them a birthday present, and they received their food with equal enthusiasm. Dinner was ravenously eaten by all, and the broth was slurped and sopped with bread until our plates needed no washing! 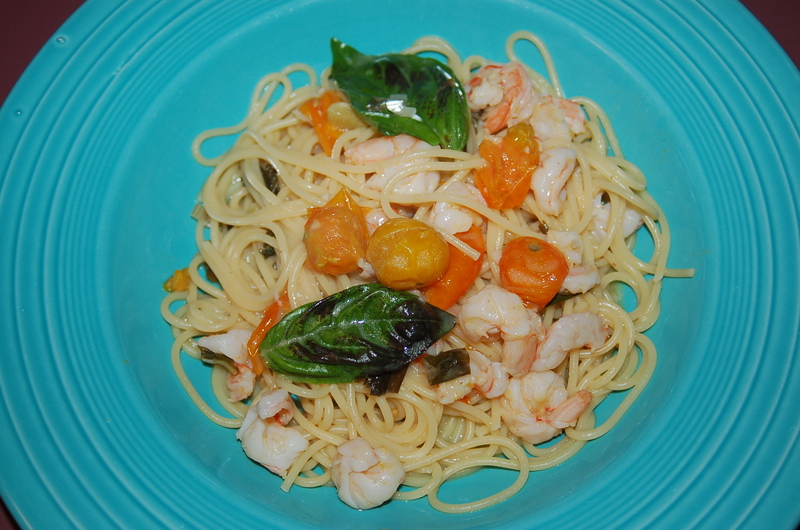 You will need: 1lb shrimp, peeled and deveined (31-40 count per lb size), 2 tbs extra-virgin olive oil, 2 bunching onions including green parts (or 4 scallions), sliced, 2 cups yellow cherry tomatoes, cut 1 cup in half and leave 1 cup whole (red is fine too), 2 cloves garlic, finely chopped, 1/2 cup chopped basil leaves, 1 carrot, thinly sliced, 1 cup white wine, 1/2 cup water, 1/2 vegetable bouillon cube,( or 1/2 cup chicken broth), crumbled, 2 tbs unsalted butter, 2 tbs freshly squeezed lemon juice, 1 cup cooked pasta water (which you scoop before you drain the spaghetti), 1 lb spaghetti (I use Barilla brand), coarse sea salt (I use Maldon salt flakes), freshly ground black pepper. 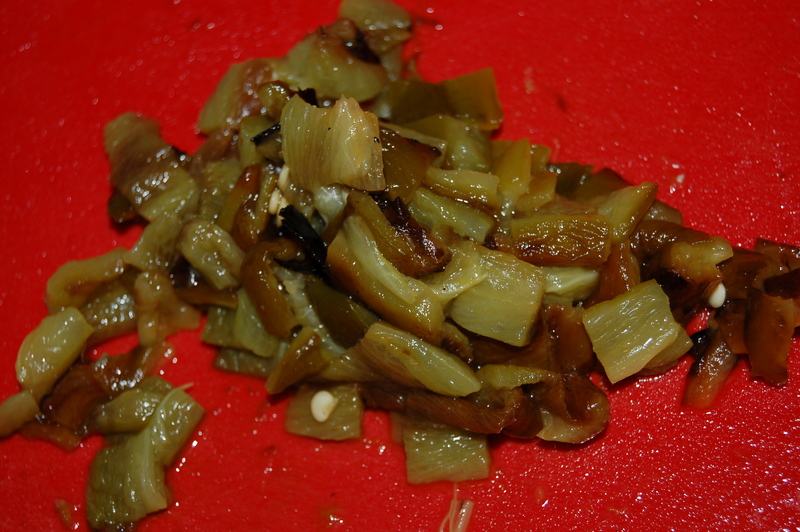 1 – Put big saute pan on medium heat and add the extra-virgin oil. 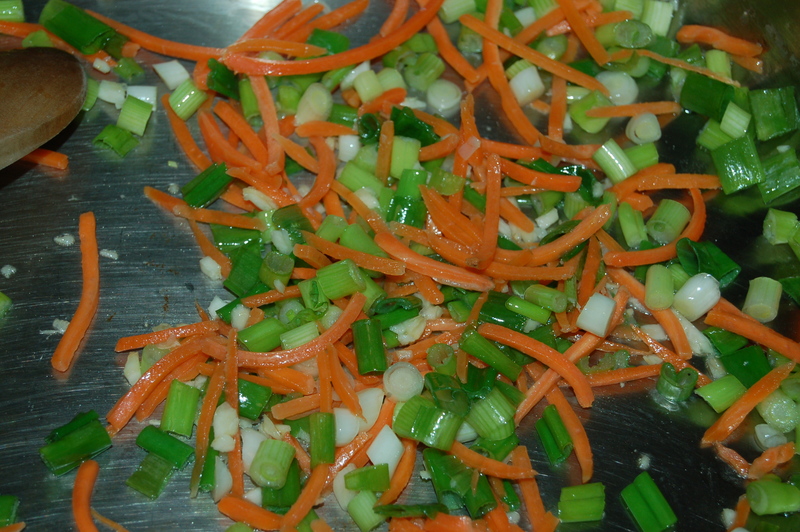 Saute onions or scallions for 3 minutes before adding the carrots and garlic. 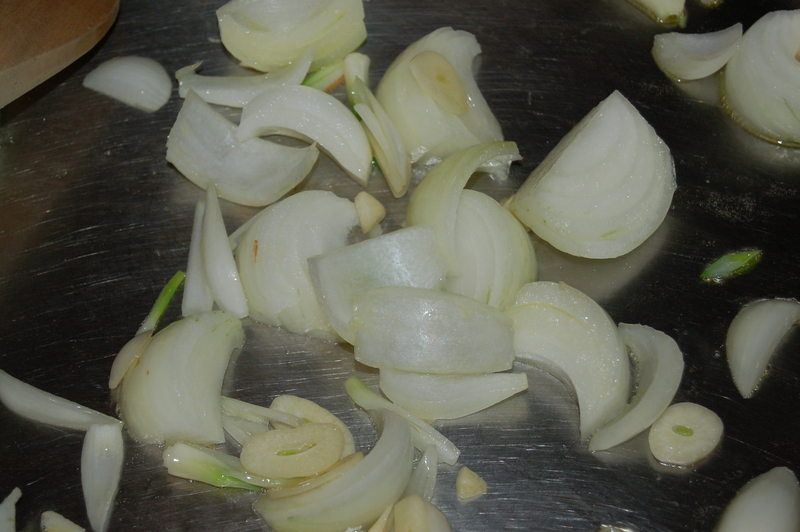 Continue to saute until the onions soften (about 7 or 8 minutes), stirring frequently (adjust heat if necessary). *Put pasta water on to boil and cook spaghetti according to instructions. 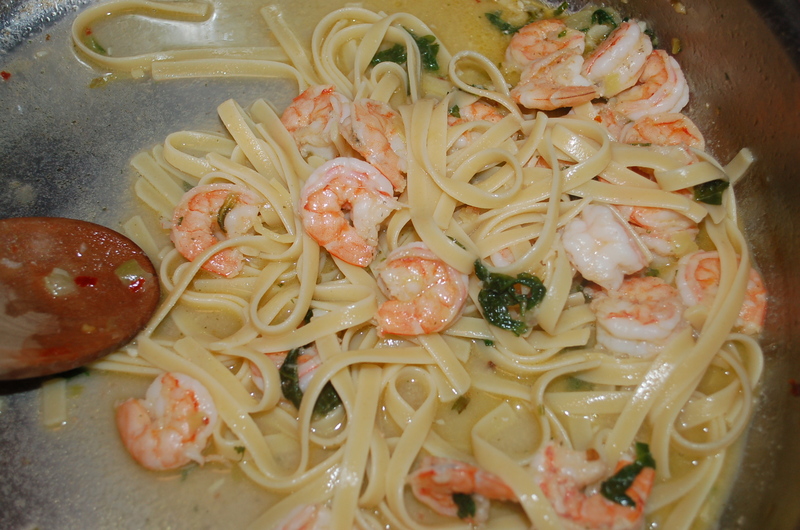 Try to time the process so as the spaghetti is ready after the shrimp has been added to the pan. 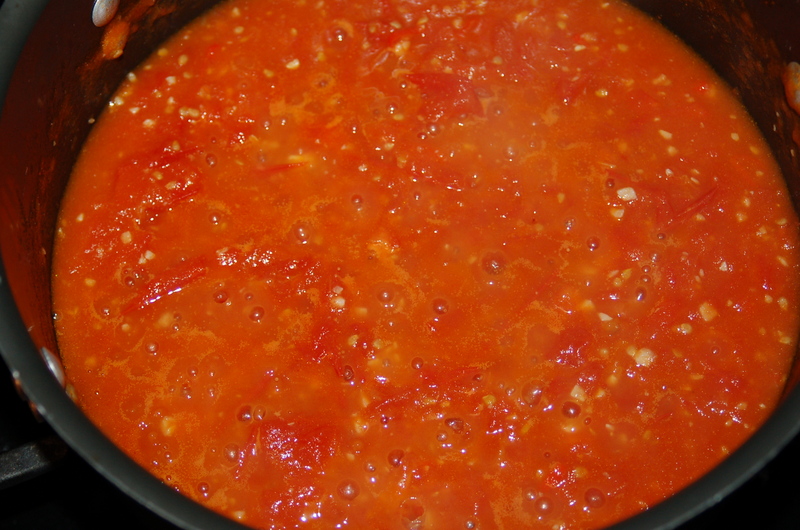 Scoop out 1 cup of pasta water before draining and set aside for use in the sauce. 2 – Add wine and let it come to a boil. 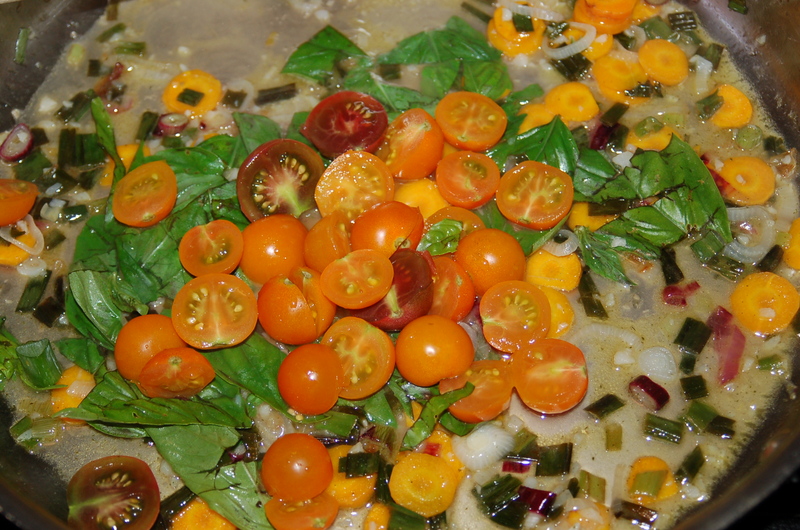 Simmer wine for 5 minutes before adding the halved tomatoes, chopped basil, water and crumbled bouillon (or broth). 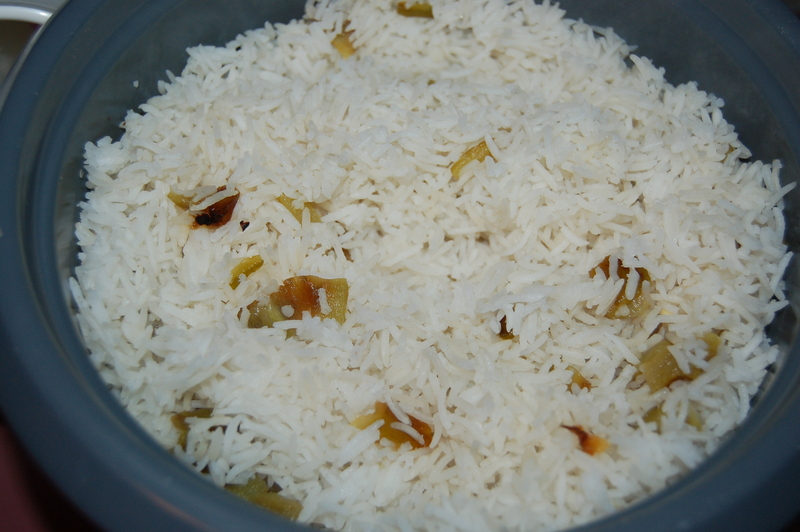 Bring liquid to a simmer and cook for a couple of minutes. Taste broth at this point and add salt and pepper according to your taste. 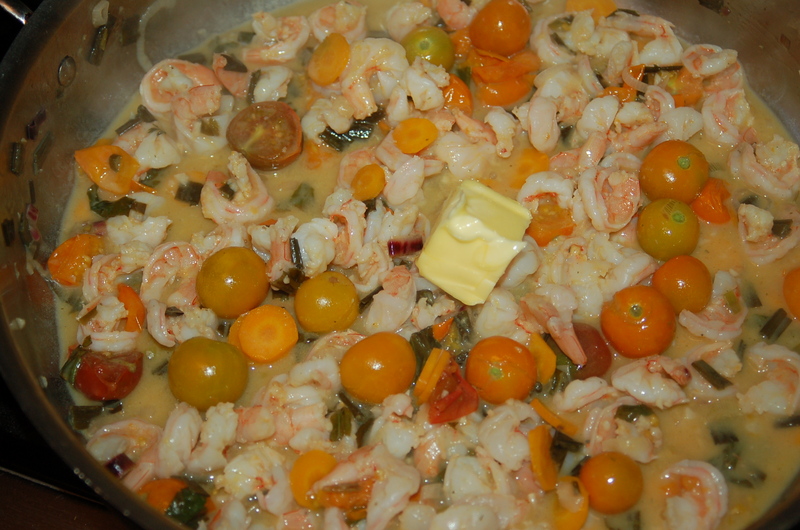 3 – Add the shrimp and whole tomatoes and bring back to a slight simmer. Cook shrimp for 3 minutes. Add the butter and lemon juice and stir. 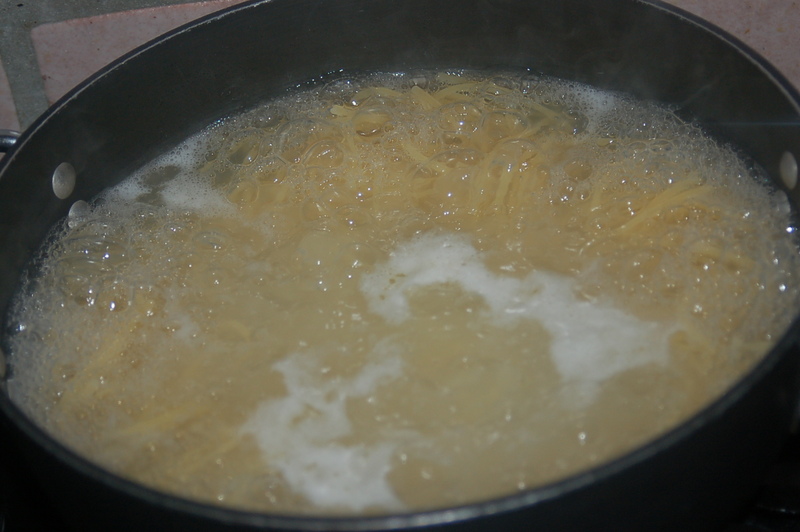 4 – Toss the cooked pasta directly into the pan when it is drained and add a 1/2 cup of the pasta water and stir. If you would like a brothier sauce (We Do! ), add the rest of the water. 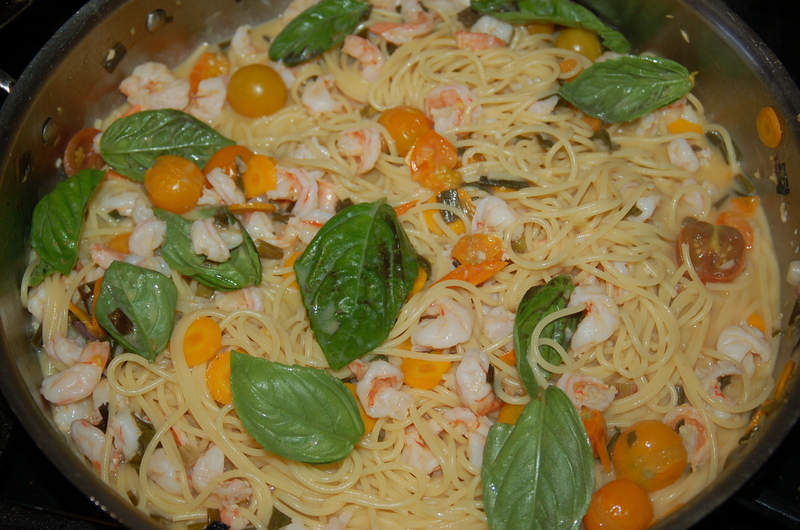 Add spaghetti, pasta water and a few whole basil leaves. Serve in warm shallow bowls with a couple of fresh basil leaves (if you have them), and a grating of Parmigiano Reggiano cheese if you like. 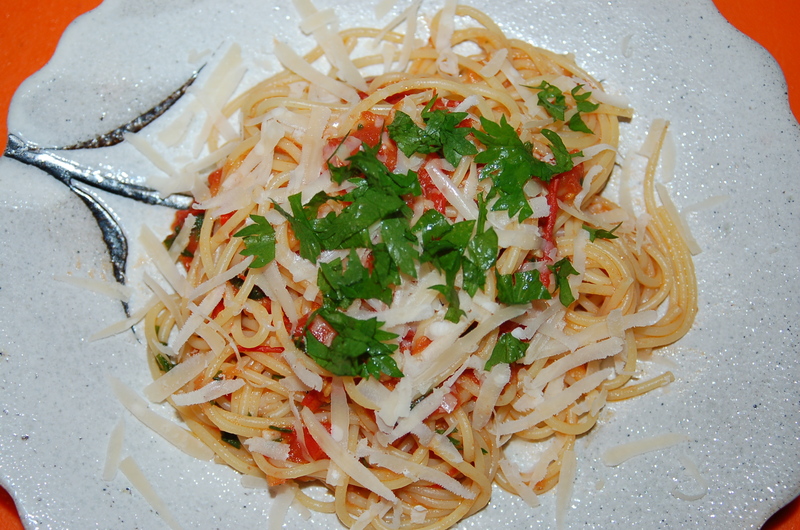 Garnish with a little Parmigiano Reggiano cheese if you have it.